Whenever I go to restaurants I have to quickly deter the waiter from grinding fresh pepper on my meal. I am highly allergic to black pepper. I react like a cartoon character by sneezing violently and often. It may be the downside to having a powerful sense of smell, but I think I became an Aromatherapist because of how strongly my nose reacts to scent. It’s fantastic when walking through a rose garden or near a bakery, but it dooms me when allergies arise. Last week I wrote about my allergy to Juniper. 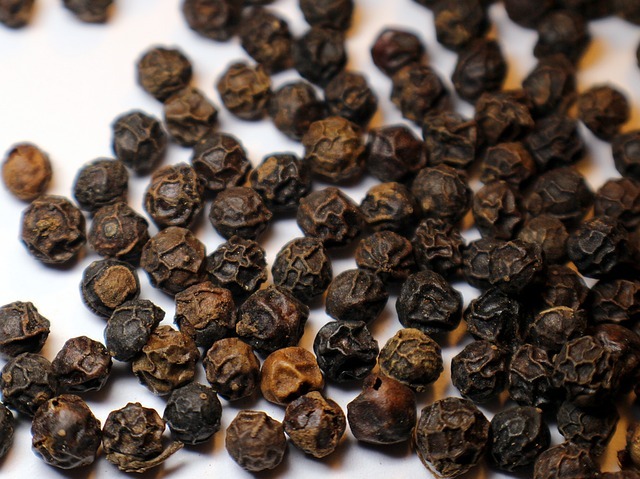 Today I address Black Pepper in spite of the fact that it makes me sneeze. Black pepper (Piper nigrum) essential oil stimulates, energizes, and warms while adding a pungent and spicy aroma. It increases energy and circulation by dilating local blood vessels. These actions make it very useful before and after sports. It is also seen as a sports oil because it can be used in cases of muscle aches, pains, bruises, and strains. The unripe fruit berry produces an essential oil that is helpful with chronic bronchitis due to it being antimicrobial, antispasmodic, expectorant, and decongestant. It also helps with constipation, heartburn, and nausea because it is a carminative. In addition, it is said to be an aphrodisiac that builds endurance and restores passion. Cases of arthritis, stiffness, rheumatism, and neuralgia can benefit from the oil’s powerful analgesic and rubefacient qualities. (Rubefacient means it causes reddening of the skin through localized irritation). It has the caution, however, that it can be overly irritating to the skin if applied in a high enough concentration or without a carrier. So, always dilute properly. If you aren’t allergic to black pepper as I am, then enjoy adding a few drops of black pepper to a diffuser to wake you up during a mid-afternoon slump. Add a drop of any citrus oil to round out the scent.